So, I'm playing with Event Sourcing, and I cooked up my own, mostly because I want to be able to explain this well to those who ask. Let's explain in code with a really simple domain that everyone will understand -- Bank Accounts, you better have one! How does one get a Bank Account? They open it, right? So I made this event. Now lets make a quick domain POCO domain object for an account. The ctor will take this event, and do some cool stuff with state. Looks like this. Two interesting things to note here. First, that I'm mutating my state in the Apply(AccountOpened) method, not just in the ctor. This is because that method will be called later when we get the Account from a repository. Yeah, it's a bit different, but honestly, to me the benefits WAY outweigh this single "drawback" to me. What benefits, you ask? Glad you did... We'll get there in a minute. Second difference is that UncommittedEvents object... We'll also get to that in a minute. For now, lets write a quick integration test and watch WhaleEs in action. First, we bootsrap WhaleEs, like so. I'm just parsing some text file that has my Amazon info in it here, then calling WhaleEs fluent config API so that I can get an Instance of Repository. Next I'll create an account and save it. Kinda boring, huh? Let's go look at the guts of Repository, cause I know that's what you wanna see. Just a little reflection magic here. I really don't wanna make people reference my library and ruin the POCO on their AR objects, so I just let them set the method name that contains the list of Uncommitted objects. That's pretty much the convention everyone is using for ES so I'm sure we'll be ok with that. Anyway, I'm calling that getter, then persisting the events it returns (calling the object that I blogged about last). The get method is uses similar logic. It simply pulls the event stream for the AR with that Id, then uses reflection to call Apply(event,true) for every event, rebuilding state. It sends the extra true parameter for isReplaying, that way the AR won't add the event to it's UncommittedEvents property. Here it is. Not to horribly complicated actually. Lets see if it works. Sweet! Console outputs 100, just like I opened the account with. Let's play with this a little more. Make a couple deposits and withdraws. This works great, test passes, and that proves that we're actually rebuilding state. "So what Elliott! I could do that by just saving state, you twit!" you say. Yes, tis true, my dear friend, you certainly could. However requirements change. Let's say they did, and know we want a list of all activity that ever occurred on the account. In good 'ole state land, we'd just cross our fingers that when we originally designed the system we had the good sense to actually save Deposit and Withdraw objects to some persistence, maybe we would, but maybe we wouldn't. Point is, working this way, even though we didn't it is very easy to add an "ActivityList" property to our Account object. Just modify the Apply methods for the appropriate events.... Like so. Add a quick test like this. Anyway, I know there's a ton of writings on this stuff, but I hope this helps someone somewhere. Feel free to yank the code down from github at https://github.com/elliottohara/WhaleES. So yeah, I'm doing it too. Writing an event store. Not really because I think that Jonathan Oliver's isn't good, just because I wanna wrap my head around it. Lemme break down Event Sourcing into as small as a nutshell as possible. Event Sourcing is the storing of a "stream" of events that represent the history of all that has happened in a system, and using that to create state instead of simply storing the state. If that doesn't make sense to you, well, that's not the purpose of this blog. Go google it a bit, and read some more, then come back. 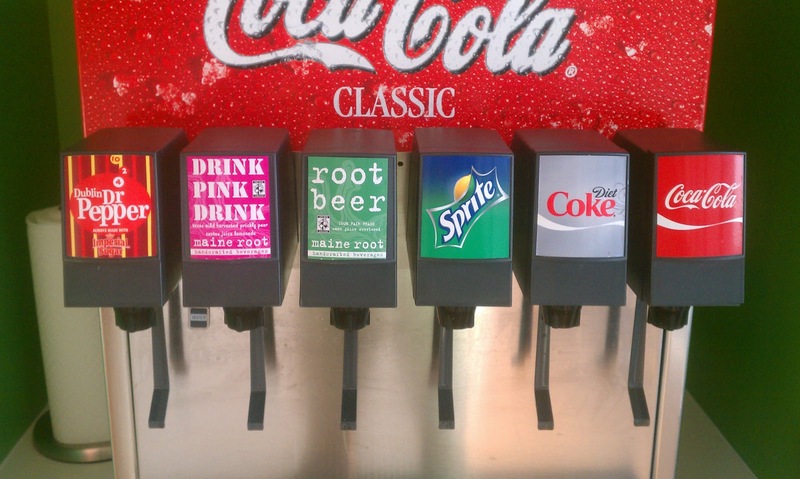 This particular post is about the quick and dirty ES implementation I'm writing. If you're too lazy for google, here's a few great links. Here's the idea. Events are raised by Aggregate Roots, and I'll create one stream for each AR. 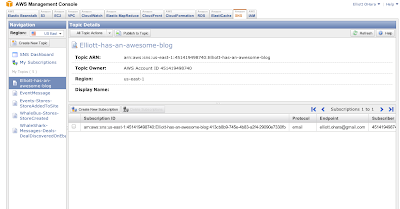 I'll serialize the stream of events (for now using JSON) to a Amazon S3 bucket with a key of the type name of the AR. Seems pretty simple to me... Let's give it a whirl. I think I'll make an EventSource object where T is the AR type... Here's a quick integration test - starting with actual integration because, well, because I don't wanna get bit by Amazon quirks that I'll miss in a unit test. Not really a test, but I'll just look in S3 for the file for now... Like I said, this is quick and dirty! Let's go make this happen. So first, we're gunna need a way to tell the serializer what types the actual events are, so we can't just dump them all in a file and persist it. I created a quick little EventEnvelope class that wraps that. Like so. We'll just serialize a list of these to S3. Ok, lets do this. Looks pretty simple... Run the test. No exceptions and yep, I see a file there. Cool. Looks ok so far. Now lets make that GetEventStream method work. I'll add a test that'll just write out the TestEvent.What value that I just put up there. Pretty simple... Now lets make it pass. Pretty simple huh? We're just calling that ExistingEvents for method that yanks the file from s3 for that Id..
Run the test, and yep, I see "Blah" in my console. Ok, so I'm not sure if this code will actually get used, because Jonathan Oliver did some really great ES stuf and he's working on S3/Simple DB implementations now, however, I really wanted to create a quick implementation for some POC stuff. I was surprised at the simplicity of this. Next up, lets see if I can write something to get some AR state working of a stream. 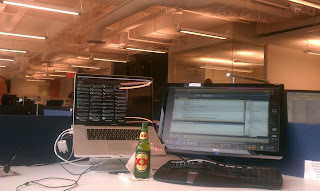 So the Los Techies Open Spaces Event was amazing. I have never in an environment where I was surrounded by so many people that just "got it". It was just awesome. First of all, go sign up for AWS, it's free to sign up, and the free tier allows 100K SNS and SQS requests and up to 1K email notifications. Done? Ok cool, let's get to coding. Let's publish a message to the cloud real quick like. Spin yourself up a project and get AWSSDK.dll (it's on nuget- just search for Amazon, it's the first result). Simple enough, I see the topic arn on my console when I run it. 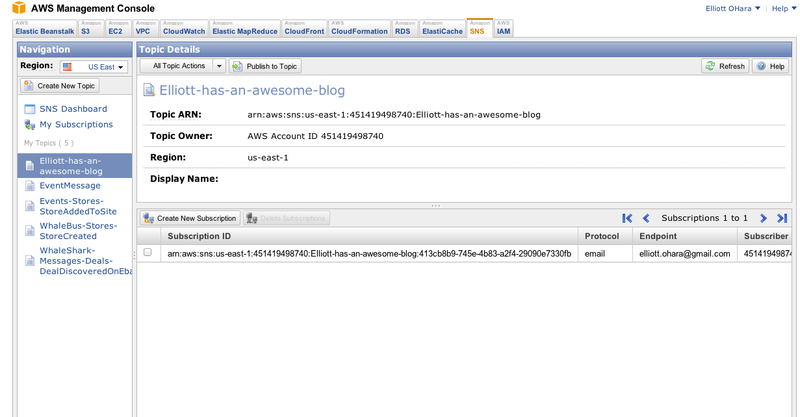 And I can see the new topic in my aws console. Next up, let's publish a messages to that topic. First, let's just set up an email end point through the aws console (we can do it programatically just as well, but I wanna publish real quick like). Now, amazon sends me an email to the address I specified and makes me opt in (otherwise this would be a really cool way to piss people off, huh?). I follow the link in the email. Subscriber is done. 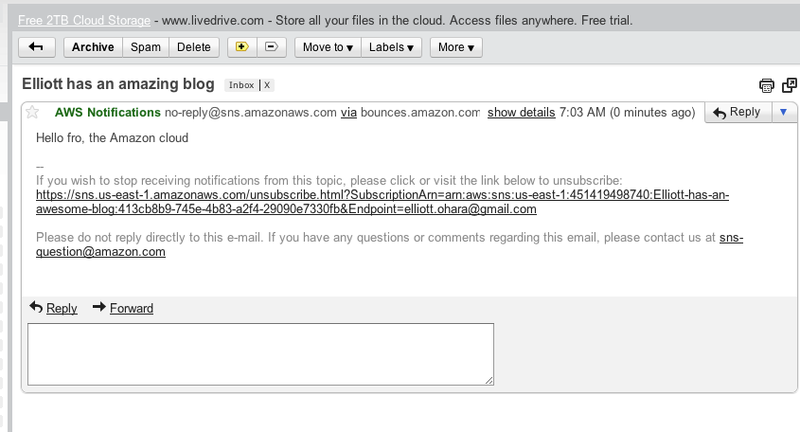 Now, when I publish a message to this topic, I SHOULD get a email with the message json serialized. Let's try it out. Run the test, and check my email, and booya! So, there we go, I just created a topic, then published a message to that topic. However, I'm having a hard time seeing how useful getting emails of published messages is, I mean, I could just send myself an email with a subject of "Elliott has an awesome blog" and a body of "Hello from the cloud" and get the same result, right? So, lets, now go set up a subscriber that has a little more value. SNS supports HTTP posts, but let's not do that, lets use an SQS queue. Yeah, we can create one through their ui, but lets do it with code. Ok, ok, lots of code there, but it's almost all security stuff that you'll only do once per sqs queue. Everything from line 21 - 30 is simply setting the security to allow SNS to publish messages to the newly created SQS queue. Now, let's create a go publish that message again and write a quick little test that'll pull messages from the sqs queue. So, I run the publish_a_message test, and I see the email arrive. So I know the message made it to SNS, let's write the code to pull from the sqs queue. All this code is doing is looping for 5 seconds and calling RecieveMessage, then writing the contents of the message to the console. Here's what I see. So, yeah, it works, and it's simple. So I like it. Whatta ya think? The problem I'm solving at WhaleShark is to communicate things across different applications, as in when something happens on www.retailmenot.com, we may want to create some content on www.deals.com. 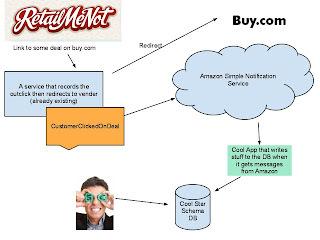 This fits naturally with Amazon Simple Notification Services. 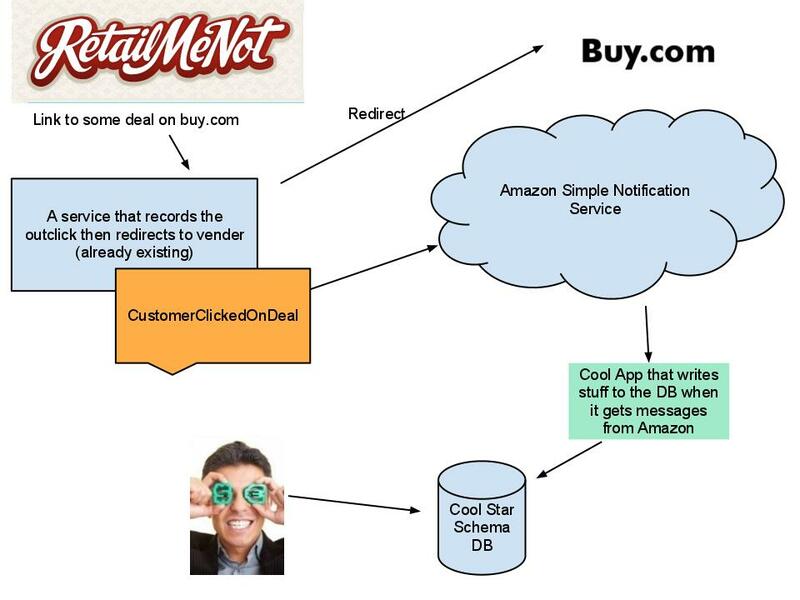 Amazon SNS is simply a push mechanism. You have "Topics" that endpoints subscribe to. The endpoints can be of various types (HTTP post, HTTPS post, email with json payload, and Amazon Simple Queue Serviecs). We'll be creating a topic per type of event. To publish an event, consumers just call EventPublisher.Publish(T @event). The event publisher will create a SNS topic if one doesn't exist, serialize the event, then publish it to Amazon. It's actually pretty simple. 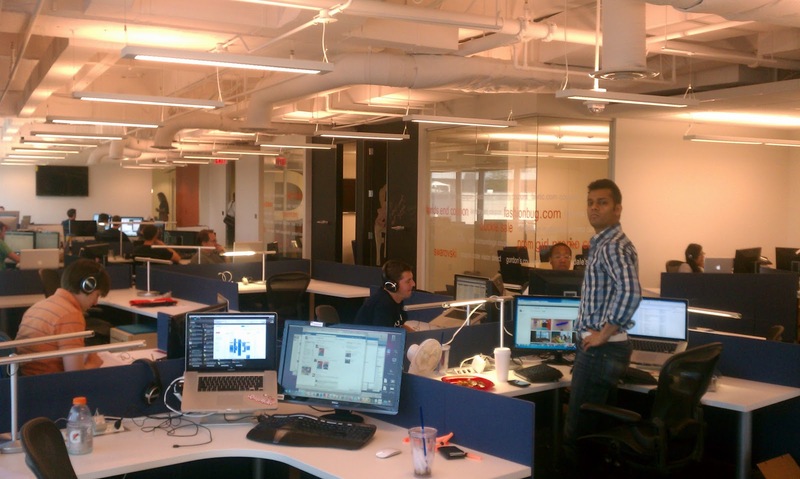 I really like this approach, because at WhaleShark, we have a quite a few non .Net websites. We can still push up events pretty much any way we want (they're just protocol buffer serialized messages) to the proper SNS topic, and all subscribers will be notified - regardless of platform. For subscription, we use WhaleBusHost. It's simply an executable that pulls from SQS queues. All instances of WhaleBus require a config property to be set for ApplicationName. This application name is used to create an SQS queue. 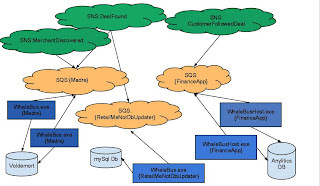 All instances of WhaleBus with the same ApplicationName will share an SQS queue. This is pretty cool, because you can throw more instances easily for scalability. After it creates the SQS queue, it then scans the application bin directory for all classes that implement IDomainEventHandler<>. It'll then pull out the type for the event, then have the SQS queue, subscribe to that Event's SNS Topic. The green clouds are SNS topics, Orange ones are SQS queues for specific applications, the blue boxes are instances of WhaleBusHost.exe pulling from those queues. Note that those green clouds can also send messages via HTTP posts, I just didn't show that in this diagram. I really think this an awesome approach to a very real problem. At WhaleShark we want to be able to quickly acquire new websites, and allow our current operations staff to use the tools they're currently using to moderate content and activity on the new sites. Instead of ripping the guts out of each of the new sites, this way we can simply write a publishing and subscribing code that publishes events our administration website will care about. The subscription code for those events will already be written. Picture anyone? 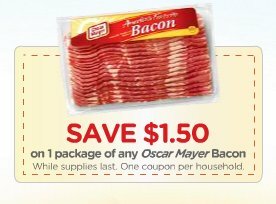 We'd definitely want to have that content to show on baconcoupons.com right? Given a system kinda like this. We've got a few options on how to make that happen. 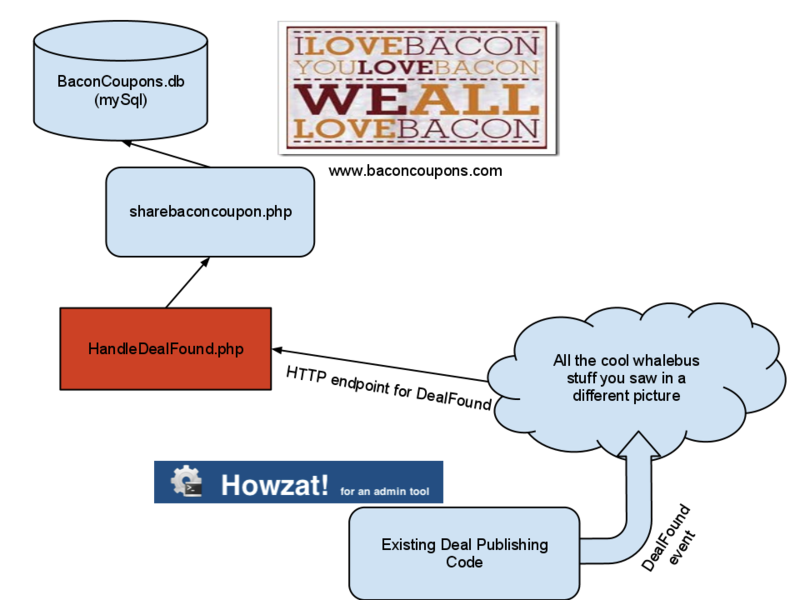 Write some quick mapping code that maps from DealFound event to what is expected as a post to sharebacon.php and add it as a new HTTP endpoint for the DealFound SNS endpoint like so. I don't think there is a right or wrong approach here. It totally depends on the logic that exists in sharebaconcoupon.php, and the team structure (did we get a bunch of new php superheros when we acquired baconcoupons.com?). I'm guessing that we'd be more inclined to number 2, since any business logic that exists (checking for duplicates, etc), would be in .Net code, and could use libraries we've already written, but that doesn't mean that we can't (or won't) use the first approach. Also, If you're familiar with NServiceBus, and this code looks something like it, that's not an accident, I think Udi Dahan made a awesome product, and I've used it with great success on a few projects. I've just got a few different problems at the new gig, and figured I'd give my own little service bus a shot. To be fair, it's pretty much the Ellemy.CQRS stuff I had been blogging about before moving here, but yeah, I spent the last week making it work a lot better to solve some problems we have here. We own coupon websites - a lot of them. The business plan is pretty much, buy them up, make them a little better (hopefully), throw a little better marketing at them, and make LOTS OF money. The state of our current systems looks something like this. 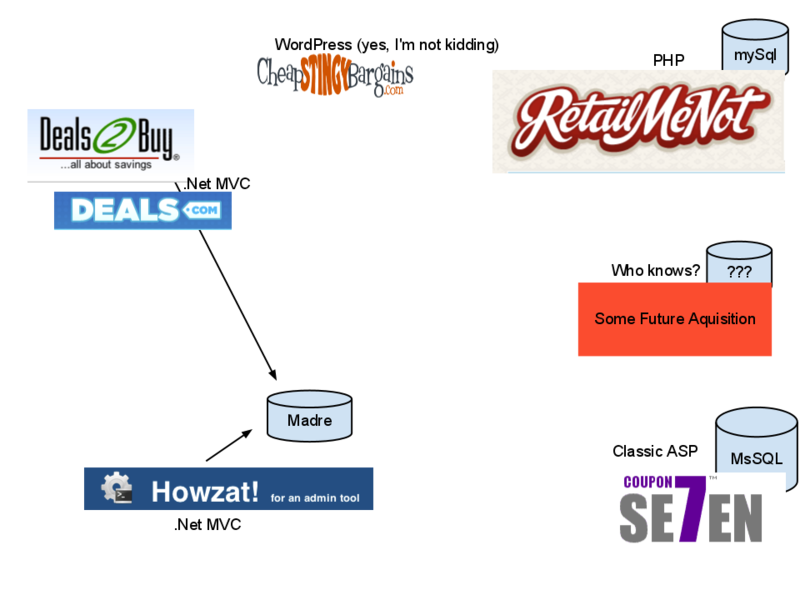 Note that Deals2Buy.com, Deals.com, and Howzat where all greenfield applications. They're things our internal staff wrote from the ground up. They wrote them in a traditional N-Tier approach, they all share a Voldemort document store that we've named "Madre". We clearly have a lot of work to do. It's not cost effective to acquire a property, then train ops employees on how to use the admin features of each website. That's how things are being handled now. We've gotta change that.. Certainly one approach is to migrate all properties to "Madre". It would "kinda" work. However, to me, that's a LOT of work. At the end of the day, ops needs to be able to use one application to update ANY website that we own. That's it. There's no requirement that all apps share a single database, just that the apps can be updated from a single application and that our execs can see the money we're making. Well…. That sounds like a great candidate for messaging huh? Think about it. The business logic for most (if not all) use cases already exists on every website we'd ever acquire, right? I mean, when someone shares a coupon on some php site with a mysql data base, there's already code on that site that updates the data base… Otherwise, well, we probably wouldn't be buying it. 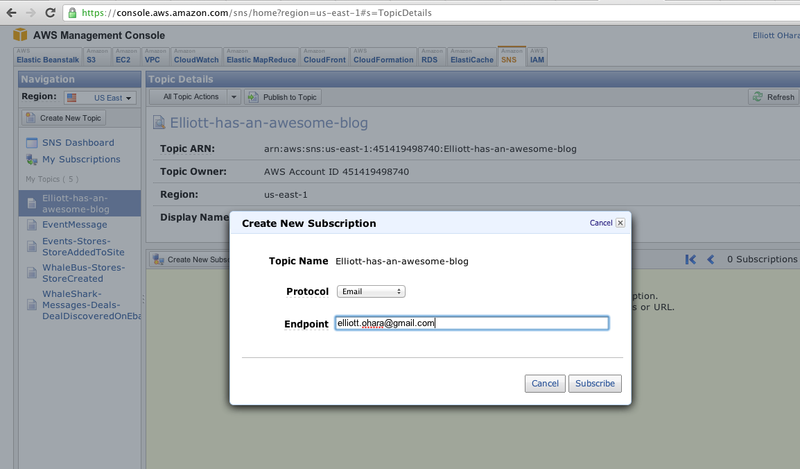 We already use Amazon Cloud services for lots of stuff… Simple Notification Service is PERFECT for this. It supports a few different types of endpoints, including HTTPS post. So, our admin interface pushes some message (a domain event) out to SNS, and we configure SNS to have an HTTPS endpoint to some page on our site that takes the post. Here's a pretty picture I just drew using google documents. 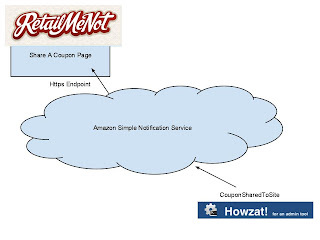 This way, the only thing new we need to write on RetailMeNot is some HTTP endpoint that translates the CouponSharedOnSite message to call whatever code ALREADY EXISTS on RetailMeNot. Pretty simple, and makes the acquisition of new properties MUCH much easier (something that makes our CEO happy - and having a happy CEO is a good thing - trust me). Ok, so, that's awesome and all, but we've got a finance department, they like to say things like "Hey, we're 8% up in revenue over projection" and they wanna know if they're actually telling the truth. 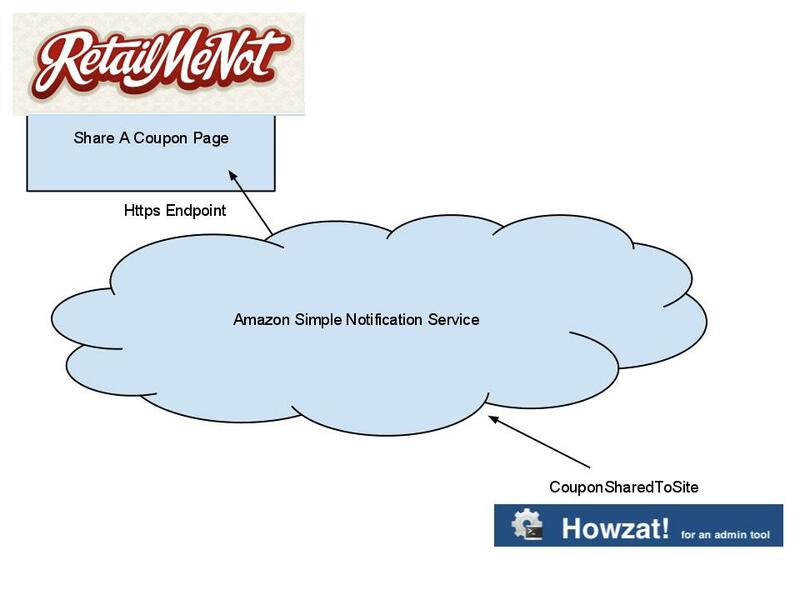 The picture above is awesome to get customers on RetailMeNot to see some coupon that one of our ops person created on the Howzat application, but what about when finance wants to know that someone actually clicked on one of our coupons? Well, we're working on a really nice database, that for the purposes of this blog, we're gonna say is totally complete. All we need to do is update that database when someone clicks on a link that goes to a vendor. Note that we want this to happen for ALL of our properties, and also note that our CEO love buying new websites. Also note that this is how pretty much EVERY coupon site makes revenue so they all record these outclicks in some way. All we need to do is add code to whatever exists on those properties that records the outclick to send a message out to SNS, and we'll write an app that subscribes to these messages. I'll draw you another picture, cause I think google drawings are cool. Ok, cool pictures and everything right? 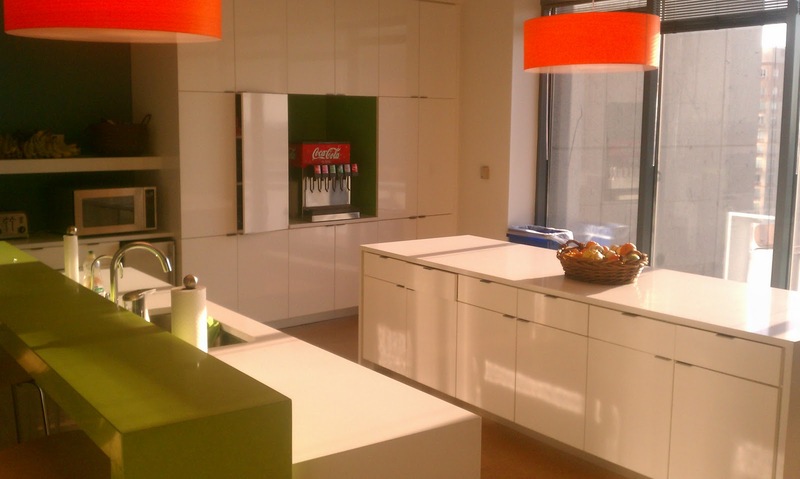 But no one comes to my blog for pictures… Let's talk code. For now, I'm gonna just go over how to use my new little pet project, we'll dive deep into the code in some future blog. First of all, all the messages we'll be sending are DomainEvents, not commands. This is because commands handling is (for the most part) application specific. If you don't understand this, well, read that link for DomainEvents. In a nutshell, DomainEvents communicate something that has ALREADY HAPPENED that other systems may care about, like "Customer Clicked On A Deal" or "Some deal just was just expired". When an event happens, applications want to do things based on that event. Let's express that in code. So, if we wanted to add a row to some db table when a customer clicked on a deal, we'd simply write the code in a class implementing IDomainEventHandler<CusomterClickedOnDeal>. I'll show some of this in a future blog, but for now, I'm gonna assume that you can figure that out. 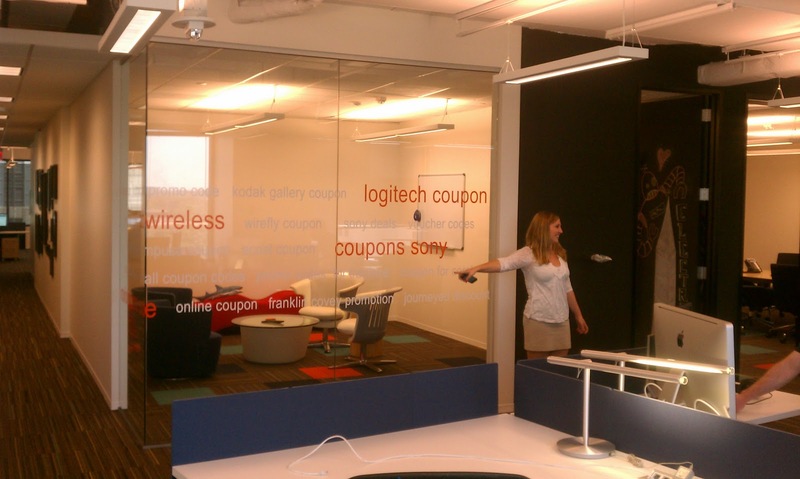 I had two real use cases in this blog, one where we where publishing an event, and one to subscribe to it. Here's the code you'd use to publish events…. You'd probably do this during app startup and make your publisher a singleton since you only need one instance of him for the app. We can talk more about that later. This code tells WhaleBus to use GoogleProtocolBuffers for it's serialization mechanism (you can also use Json), and what assembly contains the events. If you've got events spread over multiple assemblies, just keep calling EventsAreInAssemblyContainingType... It'll add them for you. To publish code you simply call Publish<TEvent>(TEvent @event) on publisher. 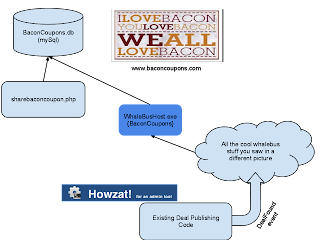 WhaleBus will do all sorts of cool stuff for you that will discuss in a future blog. Here's the code that's in the Example on github for a publisher. Now lets show a subscriber. We handle subscribers a bit differently. For now, I've written a console app called WhaleBusHost. 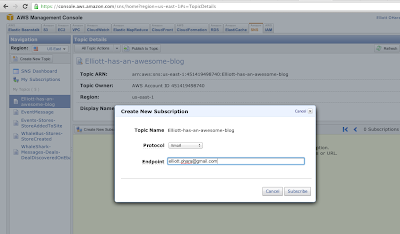 To use it, you simply reference it, and write a class that implements the IConfigureThisSubscriber class. Here's the one that's in the example on github. That's really it. WhaleBus wires up all your subscriptions for any event that has a handler in every assembly in the applications bin folder. So as you add new functionality (handlers), you don't have to manually do much of anything. Just run WhaleBusHost.exe. We'll discuss how everything works on the next post. Sorry to everyone for not blogging for a while. Started a new gig and haven't had as much personal time. I do plan on continuing work with Ellemy.CQRS and have some pretty cool that I will be blogging about in the near future. 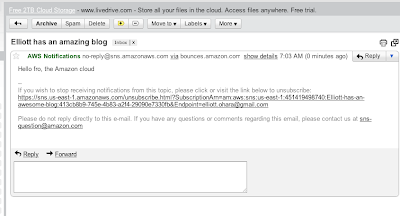 Also, I DO have a email subscription to my my Amazon account and I checked in some code that let people use it. Well, some of the messages being pushed out to the cloud looked suspiciously like someone thought they where a really cool hacker. They weren't and whoever you are, since I'm not using SQL, attempted SQL injection attacks sent to an event bus that doesn't use SQL probably won't do anything except make me laugh when I read the email that I get for every message published. I went ahead and changed my Access Key so. So sorry folks, if you wanna run the tests, simply sign up for an amazon account at https://aws-portal.amazon.com/gp/aws/developer/registration/index.html and use use your account. I'll catch up with everyone soon!